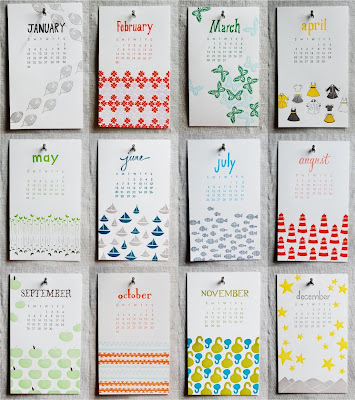 I spotted these lovely letterpress calendars from Linda & Harriet. The simple designs are right up my alley. What is even more lovely is that they double as postcards. Once you are finished with the month flip them over, cut the month part away, write a note to someone special and drop it into the mail. How innnovative those calendars are; yes I love the design on the month of April as well.., So glad I found your blog; love the name!.., I'll have to check back often.